If you are planning an outdoor wedding and your wedding venue has no indoor plan B option in case of rain, you obviously need a wedding tent. Don’t wait until the last minute to deal with this as wedding tents can get quite high in demand during wedding season. The perfect timing for renting a wedding tent is right after you’ve booked your wedding venue. Although there is no right size or shape when it comes to wedding tents, there are some rules of thumb you have to follow. For example, unless you already have a clear vision about your wedding theme and style, it’s best to opt for a square tent that comes in the biggest size your wedding venue can house. It gives you the biggest freedom to adjust it to your wedding style afterwards (ceremony, cocktail party, seated dinner, buffet dinner, etc.). A liner – a wedding tent liner is that silky looking fabric that is seen inside tents, especially on TV and in magazines. It adds a lot of style to your wedding tent but can get up to 3 times more expensive than the tent itself, so you should carefully consider whether you really need lining or not. Flooring – the three options you have are ground, dancefloor, and full flooring. The first option will cost you nothing but it has its drawbacks – if the ground is uneven or soggy due to a few rainy days prior to your wedding, your guests will feel quite uncomfortable on it in their dancing shoes. A dancefloor or full flooring will save you these inconveniences but you have to add them to the base price of your rented tent. Lighting – there are numerous lighting options you can choose for your evening outdoor wedding. You can either rent your lighting or opt for a DIY one. In the second scenario, keep in mind that you will be the one responsible for hanging it before the wedding and removing it after the party is over. Heating/cooling – for heating, a tent furnace should be considered, preferably with a thermostat that can regulate the temperature inside the tent. If you are having a summer wedding, fans should be your first choice for cooling. You can also opt for AC but have in mind that the under-tent space is practically open so it will take a lot of power (and money) for this option to work properly. The most popular tent types are frame tents and pole tents. They both have their pros and cons and you should consider factors like logistics, looks, and, obviously, budget when choosing the right type. 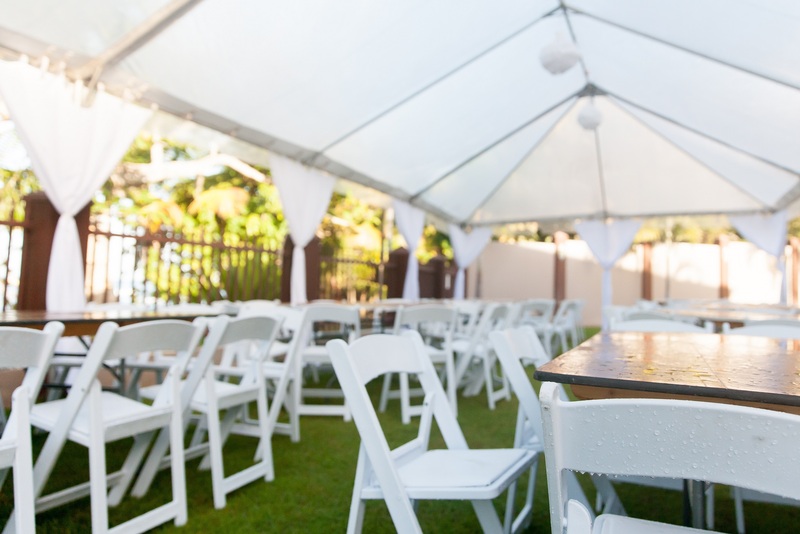 Frame tents are very easy to erect and offer more options for configuration but they are more expensive than pole tents and if you don’t use a liner, your wedding guests will see the visible frame inside. Pole tents are more beautiful to look at and they are less expensive than frame tents but their construction severely restricts your seating options as there are center poles and constructive elements that have to be taken into consideration.